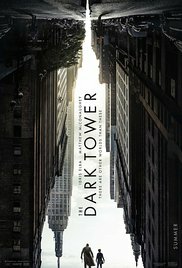 I wanted to love The Dark Tower more than I did. That's not to say that I didn't enjoy it--I did--but there wasn't quite enough backstory narrative for my liking. I came to this film not having read the books, and the movie gave me just enough background on Roland for me to get behind him. However, all we know about Walter is that he's evil and wants to topple the tower and unleash the demons. At no point are we told his motivation for this, and that left him feeling a little two-dimensional despite McConaughey's generally good and creepy performance. I enjoyed all the action and fantasy adventure; I simply wish there'd been a little more depth. I understand they are doing a TV series prequel, so maybe that will reveal more, but we really needed something in the film also--even just a glimpse--to give a point to Walter's actions. That said, I would still watch it again, and I am now inspired to pick up the books and give them a try. I read a lot of Stephen King in my teens--all the old full-horror stuff--so I think it would be good to get a taste of some of his more recent work. Overall, I would give this 3.5 stars.